Welcome back! It’s been a while, and I have built up quite the backlog of stuff to share. To be honest, I’ve built up enough for eight more haul posts. I’ve started branching into action figures as well, which we will get to in the future. This one is primarily comics, and by comics I mean manga. Which is Japanese for comic… So, still comics? Yes, comics. Comics. Let’s move on before I get caught in a loop. 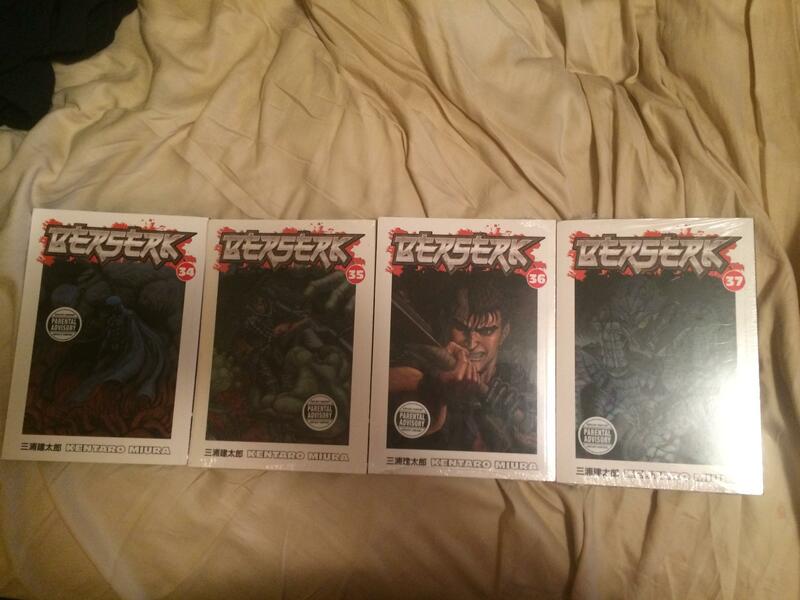 This here is the remaining volumes of Berserk that I needed to get before having them all, besides the recently released volume 38. And yes, I’ve read them all now. It is still a great read and Berserk is quickly becoming one of my favorite manga series. Without going into too much detail in the interest of avoid spoilers, there is a touching flashback chapter involving Guts. I wasn’t as interested in what was going on with the other characters, particularly with Griffith’s army and the Kushan people, but it was useful to establish what is likely going to be the next stage in this current conflict. I don’t know how others feel about the current pace of the story, but I get the impression that we are reaching the climax. I’ll have to get volume 38 and read it so I can see if my feelings change. Besides Berserk, I’ve tried to keep up with a few other manga. Firstly, at the top you’ll see a Daredevil comic that my buddy Troy got me for my birthday last March, titled “The Man Without Fear.” I haven’t had the chance to read it yet, but it looks like an origin retelling, which will be useful for me since I’m not too familiar with Daredevil, although I had this kickass figure of him as a a kid which, besides the fact that he’s almost completely red, made me all the more interested in his character. Plus, the fact that it’s written by Frank Miller acts like a seal of quality, as he is one of the biggest comic writers out there. Thanks again, Troy! 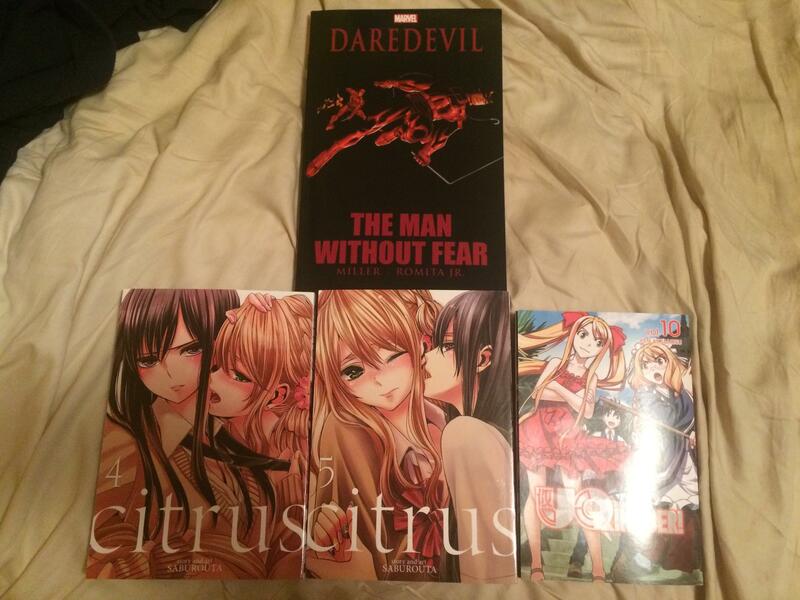 Directly under it is volumes four and five of Citrus, the latest in “yuri” (basically girl-on-girl in manga/anime form) storytelling. It seems to be the new hotness in the genre and I enjoy it. Yuzu’s relationship with Mei is fun to watch unfold, with Mei being pretty hard to read. I both like and dislike this about her character. On one hand, it makes her more realistic and appear as if she doesn’t know what she wants romantically but on the other hand, it’s annoying as hell, haha! There is an anime adaptation in the works, so it will be interesting to see how Mei is portrayed. I will continue to read as the story progresses. Next up is volume 10 of UQ Holder, the sequel to Negima. While Negima was a magical school life harem series with shonen elements, UQ Holder is straight up shonen (with the magic and stuff) so I kind of like it more than Negima. There is still plenty of gags and harem shipping though, so it doesn’t feel like a completely different story, which is good as a sequel. I’ve also read volume 11, but I will get to it at a later time. As far as volume 10 is concerned, it’s still a bit before the big tournament, I believe right after Tota finishes his training with Dana. Visually, the manga is very easy on the eyes and is a smooth read, at least for me. In terms of my reading speed, it’s in the middle, with Dragon Ball being my fastest and Berserk being my slowest. I’ve been told the story gets crazy later on, which I started seeing a little of in volume 11. I look forward to seeing what comes next. This is where the “mainly” part of this post’s title comes in. 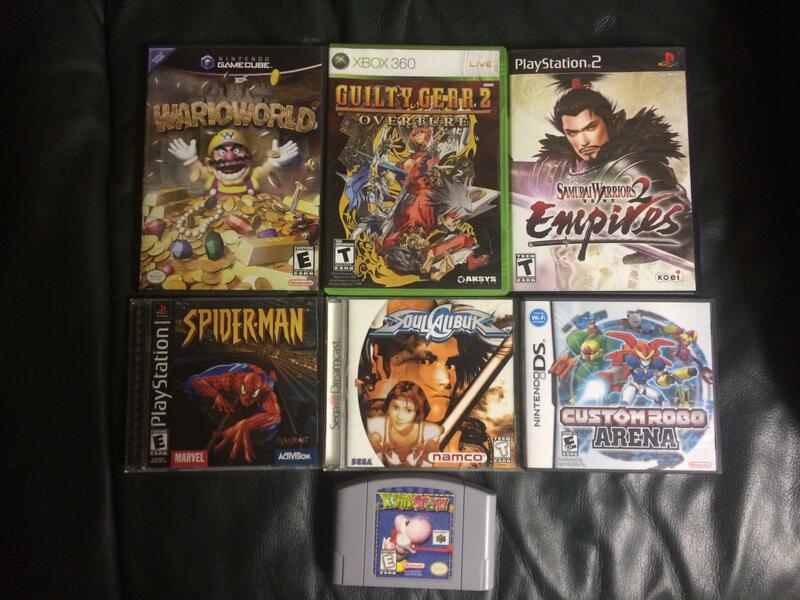 As you can see, I’ve continued to make small progress in my game collection. Like I said before, I’ve taken enough pictures for future posts, and here I will also say that I’ve made enough progress to complete a couple areas, meaning I have all the games for a specific system that I want, though some a still up in the air. Anywho, the first game in this batch is Wario World for the GameCube. I rented ths game once from Blockbuster and had fun with it. My experience with the Wario games is limited, having only played this one and the GBA one (Wario World 4, I believe.) It plays like a 3D version of the typical Wario World games, so this one is a good game to pick up if you enjoy them. Next to it is Guilty Gear 2: Overture for the Xbox 360. It’s an action game set in the Guilty Gear universe. I’ve only played it twice. The first time, I wasn’t too into it, but I gave it another chance and liked it more. It was mainly the camera that turned me off, but I got used to it. The gameplay is what you would expect, something more like Dynasty Warriors or God of War, but scaled down a bit. The game was recently released on Steam, so if you’re interested, that may be the better place to go, but I’m pleased with my copy on 360. Third is Samurai Warriors 2: Empires for the PS2. This was the first Warriors game I ever played, so I wanted to add it to my collection, having only rented the game from Hollywood Video, the one that was right across the “better” Blockbuster (where I lived, there were four nearby, plus an extra two if I wanted to venture further.) The character customization is very dated by today’s standards, but the gameplay holds up well and doesn’t feel clunky at all, surprisingly. It was nice to go back and play it after all these years. Starting the second row is Spider-Man for the PS1. This is currently my favorite Spider-Man game, mainly due to nostalgia. It was always very fun to play and I felt like I learned more about the characters, having only caught the animated series from the 90’s on the rare occasion that I would watch Fox Kids. Though, it must have aired on another channel too, because I remember watching it a fair amount of the time… Or maybe I watched Fox Kids more than I remember? I dunno, but regardless this game was fun. The N64 had this game as well as a red cart, which I hope to get, as I played both the N64 and PS1 versions. Fun times. Next to it, in the bottom middle, is Soul Calibur for the Dreamcast, giving me a complete Soul Calibur series collection, besides the arcade version of my favorite, Soulcalibur III. Anywho, if you follow this series as well, you’ll know that the arcade version of Soul Calibur was released on Xbox Live several years ago in HD. The main difference with the Dreamcast version, besides the fact that it’s a physical game and not a download, is that there is an extra mode in which you pick a character and do missions and stuff. It’s a nice way to give the game more of a life spin, since you won’t just be playing the arcade mode or doing multiplayer. Unfortunately, not all the characters are unlocked, but it’s still nice to play every now and then. And of course I made sure to unlock Hwang as soon as I could! Right next to it is Custom Robo Arena for the DS. I am a HUGE fan of the GameCube game, it being one of my top three GameCube games. With that in mind, I’ve been itching for another Custom Robo game, this one being my only option, due to the rest of the series being exclusive to Japan. I’ve only played a little bit of the game and it works well even on the DS. My only complaint so far is that the script is a bit cheesy, which is something I don’t recall from the GameCube game (not saying it was always super serious, but I remember it being less cheesy than this one.) Regardless, I think I’ll enjoy it. Finally, we have Yoshi’s Story for the N64. Growing up, this game was always a rental. I never finished it, nor was I very good at it as a kid, but it was a fun game to play. I remember not wanting to play as any Yoshi besides the red one, since red is my favorite color. I’ll probably still do everything in my power to keep me from playing as any other color Yoshi besides the red one, and with my skills as a gamer having gone up with my age, I’d like to think I can do it. We’ll see. And that’s it! As you can see, I’ve started dipping into other collections I’ve been wanting to expand, and I have plenty more to show, as stated earlier. Next post will more than likely be video game related. We’ll see how things go. I have a few ideas for future posts that I hope to get to as we continue, it’ll just be a matter of which ones I want to do first. Thanks for reading! See you next time! !